The Happiness Advantage is an interesting book by Shawn Achor. 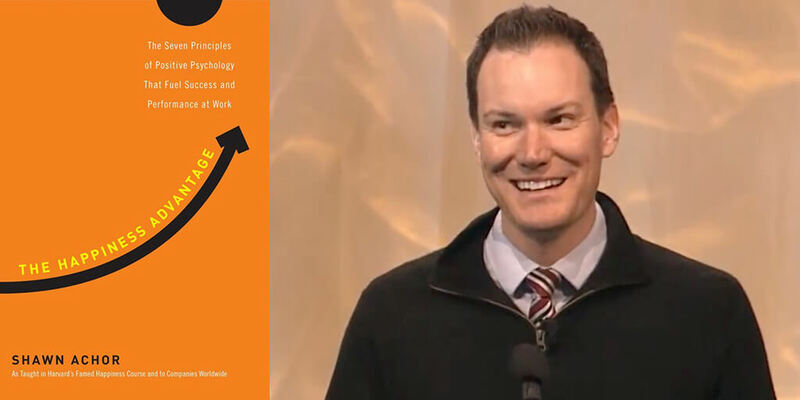 The book came out in 2010 and details the author's take on psychological principles, overall success, and work performance. Achor's take on the Happiness Advantage theorizes that the general take on happiness is not accurate. Achor goes into considerable length on his blog; in essence, happiness leads to success, not the other way around. Countless people have spent decades trying to understand happiness and what all is involved in achieving this state of being. Even to this day, many individuals believe that contentment will find them once they have reached a certain state of being, such as wealth, prestige, fame, etc. However, the Happiness Advantage rejects the notion above and moreover states that due to unearthings in positive psychology, the relationship between happiness and success works opposite than most people believe. To date, the preceding relationship is highly debated and even controversial within certain circles. There are a plethora of facets and layers throughout the Happiness Advantage. Thankfully, Samuel Thomas Davies does an excellent job of breaking them down for people to access and understand. One of the most critical elements of the Happiness Advantage entails understanding the principles of happiness. First and foremost comes the reality that each is responsible for his or her happiness. Many people regard the preceding sentiment as a cliche and believe that happiness is an entity that will come to them if they have a certain lifestyle, net worth, status, or tangibles. In truth, happiness begins from within. Happiness should also be regarded as more than a simple feeling or mood. Moods are often fleeting, coming and going as external factors occur in each person's lives. Individuals who are serious about experiencing true and genuine happiness must go about achieving it themselves. Reaching for the stars, working to achieve goals, and understanding that each person can and likely will change are also key elements of the Happiness Advantage. Another factor of the Happiness Advantage involves the brain and how each person chooses to exercise and utilize their own. Whether or not an individual views the world through a positive or negative lens will greatly impact the manner of the perception and the quality of their actions. Looking for the upsides while releasing the downsides is also another part of the Happiness Advantage. Like attracts like, positive energy attracts positive energy, while negative energy attracts negative energy. The manner in which one handles setbacks or failures is also a critical part of the Happiness Advantage and the levels of happiness which they experience. One of the truest realities of life is that no matter how optimistic one may be, life happens. There will be a variety of experiences which can appear very trying and testing at the time. When this occurs, there are one of two choices. The individual at hand can either sink into a state of self-pity and succumb to negative emotions, or they can look for the lesson and the opportunity to personally evolve. Another paramount aspect of the Happiness Advantage is the weight and significance which one attributes to their own decisions, actions, and conduct. The happiness and most accomplished individuals understand that the steps they take, the choices they make are most indicative of their forthcoming results. However, in many instances, this often is easier said than done. Sometimes life gets tough, and it can be quite easy and tempting to fault other people, things, or environmental factors for one's actions. Nevertheless, someone who truly aspires to be happy must first understand that their behaviors and choices are what causes their results, for better or for worse. A lack of responsibility or lack of self-accountability are the absolute enemies of happiness. 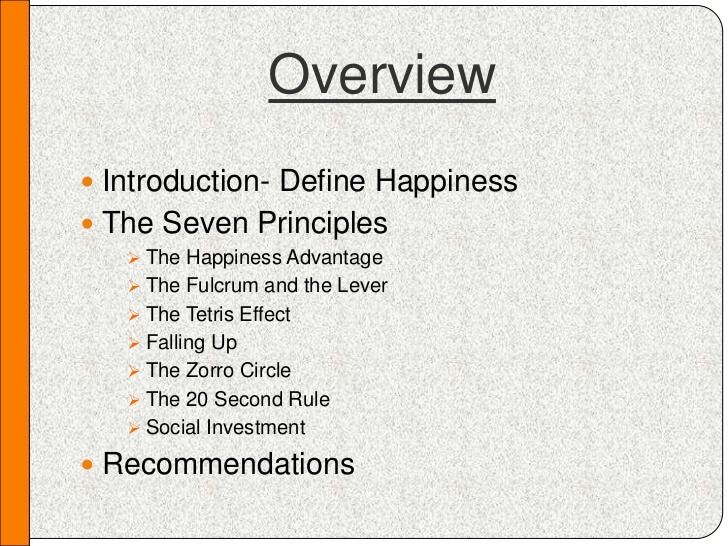 These are critical points which Achor details throughout the Happiness Advantage. Paying attention and documenting events that occur on average is a common pattern amongst human beings. How many times has one heard the phrase "on average?" Despite the regularity and commonness of minding average occurrences, the Happiness Advantage affirms that people who frequently observe and act upon the average are also setting themselves up to be average even if they do not initially realize it. In some circles, the preceding phenomenon is referred to "the error of the average." Instead of minding what happens to be average, each person should focus their energies towards exceptionality and excellence. By documenting the highest common denominators, each person sets a high bar for themselves. Although success does not guarantee happiness, working to achieve goals is a critical factor of the Happiness Advantage, as previously stated. Likewise, come the perils of focusing on what happens to be lower or below average. In many regards, this can be seen as worse than average. Individuals who focus on matters which cause failure are moreover setting themselves up for failure even if they fail to realize it. This does not equate to obliviousness or lacking awareness of which steps not to take, however, knowing what not to do shouldn't be the central focus of anyone's perspective. The law of attraction affirms that what each person focuses on is what they inherently attract into their lives. Therefore, as people strive for happiness in their daily lives, they should focus on elements, matters, and individuals which are above average. Persons who abide by this course of action will be putting themselves on the right track and in the proper mindset to experience happiness. While 'falling up' sounds inherently contradictory, the Happiness Advantage sheds some light on this phenomenon and helps people understand how falling up can contribute to their happiness and satisfaction throughout life. 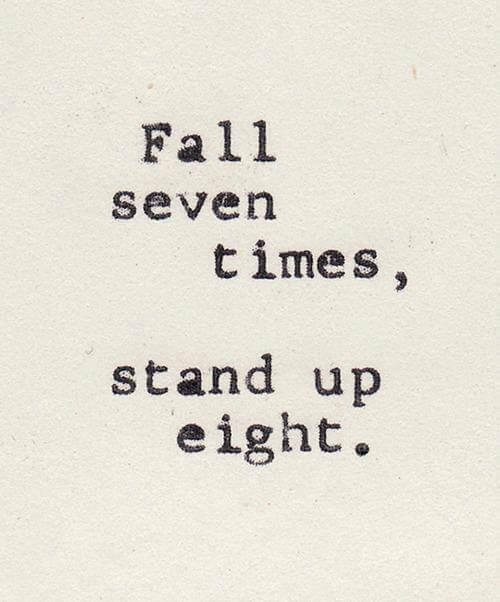 In essence, falling up entails using stressors, defeats, and setbacks to become happier and more successful. One of the few guarantees of life is that challenges and tough times will happen. However, each has the choice to either let these things defeat them (fall) or use setbacks as opportunities to learn, grow and rise above (fall up). Falling up contributes to happiness because it reinforces the notion that each person's actions and behaviors engender their contentment, not external factors. In using one's stressors or defeats to fall up, the person at hand will furthermore discover that the recovery process is often easier and faster. Wallowing in self-pity and sorrow usually worsens and extends times of suffering which can be overcome with the proper thoughts, mindsets, and subsequent actions. Throughout the Happiness Advantage, Shawn Achor provides quick and easy steps that each person can take to boost the quality of contentment and success in their lives. First and foremost comes meditation. Many people are somewhat uncomfortable with meditation because it involves simply sitting still and letting go of all distractions and preoccupations. This can be somewhat challenging to people who are used to being busy and having a full schedule. However, countless studies have affirmed the positive offshoots of meditation, which include, but are not limited to decreased stress, calmness, contentment, heightened empathy, and even stronger immune systems. Another manner of increasing happiness merely involves having certain events to look forward to. This can be a vacation, a date with a significant other, a martial arts class, etc. Regardless, each person should have things to be excited about. This can also help with the falling up process. The state of having something to look forward to also involves work on each person's end. Each is responsible for taking steps to ensure that they have a balanced and satisfying life. Virtually everyone has heard the age-old phrase, "you get what you give." This is accurate on many levels. Treating other people with kindness puts out positive energy. Each person reaps what they sow. Being impolite or unkind to other individuals does not breed happiness. The negative energy which is expelled by these actions is guaranteed to return to the sender in one form or another. Therefore, those who truly value happiness and positive energy can truly help themselves out by treating others with respect and kindness. The Happiness Advantage is an incredibly layered and insightful book which anyone can benefit from. Shawn Achor truly details a plethora of realities and critical information for people who truly aspire to experience and reap happiness and success. All the same, life can be difficult and sometimes falling up, striving towards goals, and staying positive in times of hardship can be easier said than done. Having a strong support system can make all the difference in the world. This is why BetterHelp exists. We are here to provide the best forms of counseling and therapy to anyone who needs it regardless of what they may be experiencing or going through in life. Ultimately, the choice rests with each of us. However, if you or a loved one ever need guidance, assistance, or even a simple conversation with someone who cares, you can contact BetterHelp by clicking here.